I was contacted by the owners of a cottage in the small village of Cragg Vale who had unfortunately suffered a flood in their kitchen which had resulted in damage to their Slate tiled kitchen floor. Cragg Vale is a very small village situated on the moors above Hebden Bridge in the borough of Calderdale. The cottages were originally built circa 1860 for workers at the local mill. Although the mill has now gone, the cottages are still lived in by people who enjoy living so close to the scenic Blackstone Edge Moors. It’s difficult to appreciate the problems from the before photo but once I visited the property, I could see where some of the tiles had been damaged by the water leading to flaking and salting. 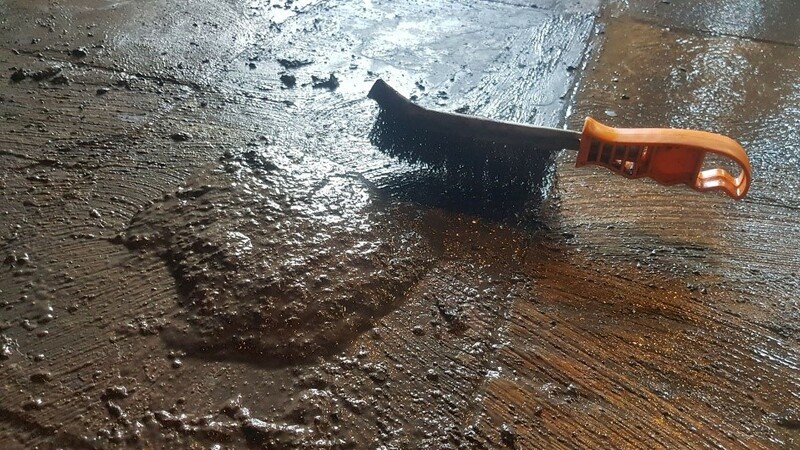 The other major issue that became apparent was that the floor had also been covered in layers of sealant and varnish which had been applied over the years. This had left the overall finish looking a uniformly dark colour although it was very shiny. After doing some tests and a full survey, I submitted a quote to carry out the work which was to be covered by the owner’s insurance. This was accepted and a date was set to begin the work. 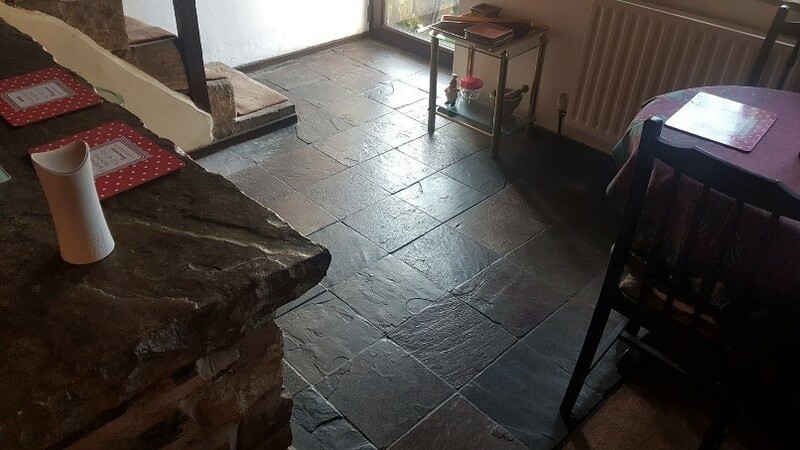 Given the amount of work involved restoring the Slate, the complex nature of the job and the need to proceed quickly, I recruited the services of South Yorkshire Tile Doctor Matt Lovett. This is one of the benefits of using Tile Doctor as we can combine our skills and equipment to ensure that a job is carried out effectively and efficiently. This job had the potential to become very messy so our first job on arrival to start work was to protect the kitchen units and adjacent carpets with protective coverings. We then applied a coating of Tile Doctor Remove & Go to small sections of the floor and left it to soak in for fifteen minutes at a time. The tiles were then scrubbed, and the resultant residue removed with a wet vacuum. The varnish proved particularly stubborn in places, so further applications of Remove & Go were scrubbed in using wire brushes to remove it layer by layer. The sealants and varnish turned to a muddy gloop that we continued to scrape up and remove with the wet vac. At the end of the first day we had removed about 80% of the coatings but knew that we still had long day ahead of us tomorrow. The next day we reviewed our progress and decided to work in one metre square areas to remove the remaining coatings. This was a time consuming but necessary way to ensure that by the end of the day we had got the floor clean. Before leaving the floor was rinsed again and dried as much as possible using the wet vacuum. After a final inspection we were happy the floor was ready for sealing and left it to dry off overnight. First job on day three was to check that the floor was dry enough to begin sealing. This is a very important part of the process because if the floor is damp then the sealers won’t take properly. The floor was fine, so I started with the application of a single coat of Tile Doctor Colour Grow which is a breathable, colour enhancing sealer that penetrates the pores of the stone protecting it from within. 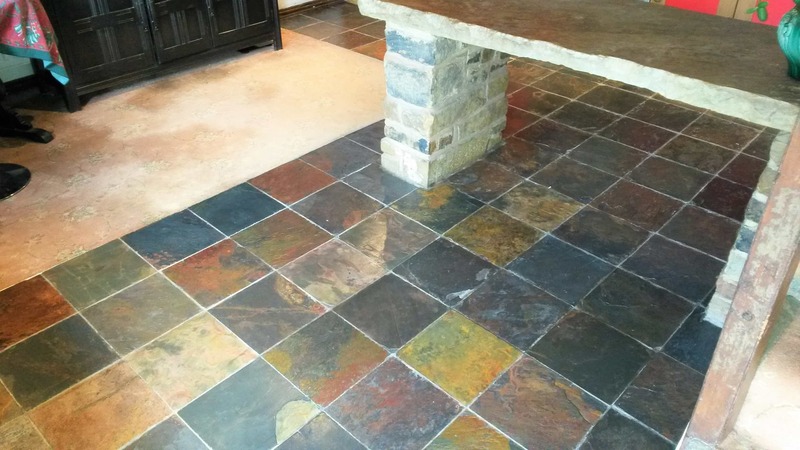 Colour grow also enhances the natural colours in the stone thus highlighting its natural beauty. After 30 minutes, the floor was dry enough to start applying the first coat of Tile Doctor High Shine sealer. This is an acrylic sealant which as the name suggests, gives the floor a glossy shine. This was the effect that the Customer had requested at the beginning of the process. A further four coats of High Shine were applied before a water test was conducted to ensure that the floor was completely sealed. The Customer was very pleased and as you can see from the photos, it’s easy to see why. 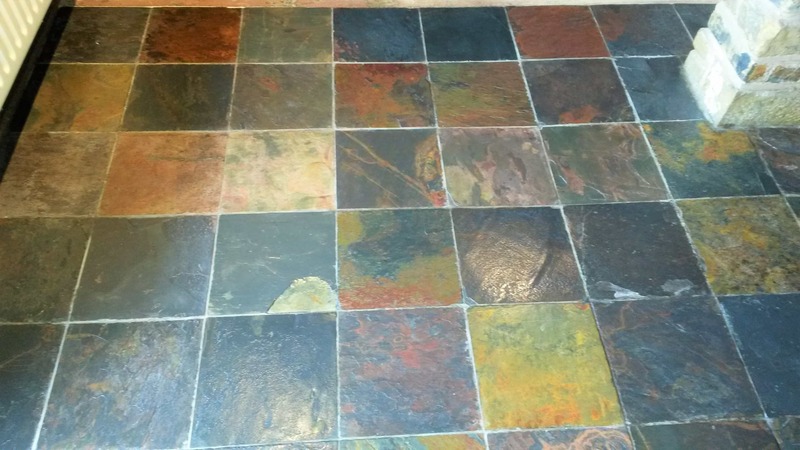 This entry was posted in Blackstone Edge Moors, Calderdale, Cragg Vale, Flood Damage, floor cleaning, Hebden Bridge, Insurance Claim, removing varnish, Repair, Slate Tiled Kitchen, Tile Cleaning Activities, West Yorkshire, Work History by TileProf. Bookmark the permalink.